An evil bishop wields the Spear of Destiny. Wicked magicians are raising an army of the damned. Our only hope—five fucked-up friars and their dog. God help us all. Fr. Dylan has spent his entire adult life ducking responsibility. As far as he’s concerned, there’s no problem so big that a bong hit or two can’t fix. But when the Spear of Destiny threatens every living soul and an army of the damned begins to gather on his doorstep, Dylan has to admit he’s met his match. 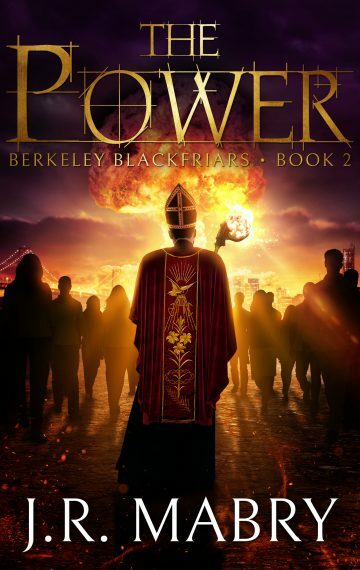 The Power is the second book in the Berkeley Blackfriars series, but it is a standalone adventure and can be enjoyed all on its own. If you love supernatural suspense laced with humor and danger, you’ll love J.R. Mabry’s Berkeley Blackfriars’ books. Fans of Buffy the Vampire Slayer, Preacher, The Dresden Files, and the Mercy Thompson series will thrill to this new paranormal fantasy adventure. Buy this book and get The Power today!